Dan Berkowitz might never have noticed the phenomenon if not for the new lights. In 2012, Johns Hopkins University’s Berkowitz had just moved to a lab space where the lights were motion-activated, and his postdoc Gautam Sikka soon began to observe a curious response in the blood vessels he had isolated for study: whenever he walked in and the lights turned on, the vessels exerted less pressure on the force transducer the researchers had attached to constantly stream data. A literature search revealed that the relaxation of blood vessels in response to light, called photorelaxation, had been described almost 50 years earlier, but the underlying mechanisms had never been fully elucidated. Berkowitz wondered if these effects were mediated by resident light-sensing pigments. If so, it wouldn’t be the first time that a sensory receptor had been found outside of a sense organ. The light, odor, and taste receptors located in our eyes, noses, and tongues flood our brain with information about the world around us. But these same sensory receptors are also present in unexpected places around the body, where they serve a surprising range of biological roles. In the last decade or so, researchers have found that the gut “tastes” parasites before initiating immune responses, and the kidneys “smell” fatty acids, regulating blood pressure in response. Sure enough, upon further investigation Berkowitz found that it was melanopsin, a light-sensing pigment that serves circadian entrainment and other nonvisual functions in the eye, that modulated the relaxation of blood vessels when the lab lights came on. 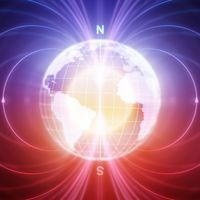 In contrast to the early days of the field, the idea of sensory receptors outside of sensory organs is no longer unusual. “They’re all just chemoreceptors, and you can use them in lots of different contexts in physiologically different systems,” says University of Colorado Denver neurobiologist Thomas Finger. Now researchers are characterizing such sense receptors present in different tissues around the body and working to understand their functions, with the eventual goal of using these receptors for various diagnostic or therapeutic applications. Preliminary trials are underway to test therapeutic uses of light-induced vasodilation in humans, for example, and clinical trials will soon test whether a patient’s taste receptors—both those in the mouth and those in the airway—could be used to diagnose and to treat respiratory infections, respectively. 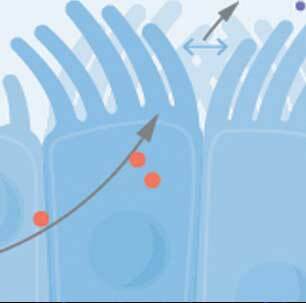 While many of the details of the receptors’ activation and downstream signaling remain unclear, researchers are finally getting closer to making sense of what these receptors do outside of the classic sense organs. And labs are using modern genetic tools, such as arrays to detect gene expression or protein levels in different tissues, to pin them down. SMELL: Originally thought to be present only in the nose, olfactory receptors exist in many locations in the body, including in the skin, heart, lungs, kidneys, muscles, and sperm. They are involved in a variety of functions, from regulating blood pressure to enhancing muscle and skin regeneration. See full infographic: WEB | PDF© LUCY READING-IKKANDAIn 1991, Richard Axel and Linda Buck of Columbia University first described the family of genes that encode olfactory receptors, jump-starting the molecular study of olfaction.1 The assumption at the time was that olfactory receptors were only expressed in the nose, but almost immediately, reports of receptor gene expression in other tissues began appearing in the literature. 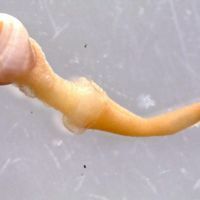 In studies published in 1992 and 1993, for example, researchers at the Université Libre de Bruxelles detected the expression of olfactory receptor genes in dog sperm.2,3 But whether these receptors were functional was still an open question. Over the next decade, Hatt’s team and others continued to identify olfactory receptors in a variety of human tissues, including the lungs, liver, skin, heart, and intestines. In fact, they are some of the most highly expressed genes in many tissues. “One can be sure that these receptors must have enormous importance for the cell,” Hatt says. Now, the looming question is: What are these receptors doing? “The big problem is that, to study the function of olfactory receptor proteins, one has to know how you can activate the receptor,” says Hatt. Humans have some 350 types of functional olfactory receptors (mice and rats have about 1,000), and researchers have only identified the activating odor molecules for 10 percent to 20 percent of them. To find out what activates a particular receptor, Hatt expresses its gene in a human cell line and exposes the cells to a panel of a few hundred to a few thousand different odor molecules, typically commercially available artificial scents such as those used for perfumes or other cosmetic products. 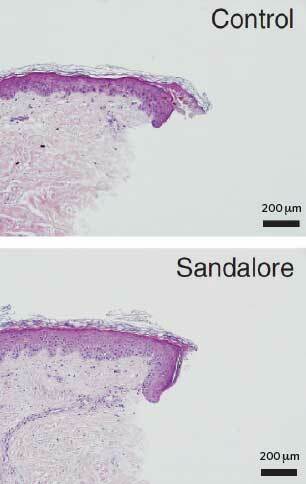 FOLLOW THAT SMELL: Treating human skin cells with an artificial san­dalwood scent called sandalore acti­vates an olfactory receptor that causes increased migration and proliferation, improving wound healing. 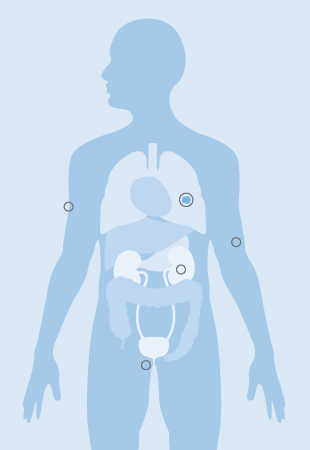 The receptor’s natural ligand is unknown.BUSSE ET AL., J INVEST DERMATOL, 134:2823-32, 2014. Using this technique, Hatt successfully identified a scent molecule that activates the olfactory receptors in sperm—a synthetic odorant that smells like lily of the valley flowers—which has allowed him to conduct functional studies. The sperm swim toward the synthetic odorant and speed up as the odorant concentration increases.4 Hatt suggests that these olfactory receptors could be guiding sperm as they swim towards the egg, though investigators are still testing this hypothesis and trying to identify the receptor’s natural ligand in the body. Hatt also found that an artificial sandalwood scent called sandalore activates an olfactory receptor in skin. Activating this receptor stimulated skin cells to migrate and proliferate more rapidly, leading to faster regeneration and wound healing.5 Again, the receptor’s natural ligand—likely a chemical or hormone with a similar structure to sandalore—remains to be determined. Some olfactory receptors have similar functions in different tissues. In 2009, Emory University’s Grace Pavlath was studying how muscle cells fuse to form multinucleated fibers when she noticed high expression levels for the same olfactory receptor Hatt had found in sperm. She found that this olfactory receptor attracts muscle cells toward a particular scent, thus directing muscle migration. “It makes absolute sense that you would use it as a ‘tractor beam’ to tell cells where to go,” Pavlath says. 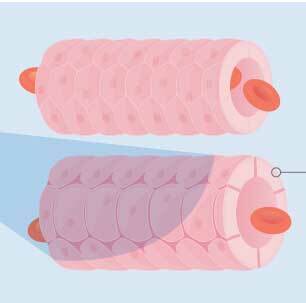 Without this receptor, muscle fibers in mice are more prone to injury and regenerate poorly, whereas overexpressing this receptor improves regeneration.6,7 Finding the receptor’s natural ligand “would allow you potentially to design drugs that could activate this receptor and enhance muscle regeneration,” says Pavlath. In a few cases, researchers may have identified the natural ligands responsible for activating olfactory receptors around the body. In the kidney, for example, Johns Hopkins University’s Pluznick found that certain short-chain fatty acids produced by gut bacteria can activate olfactory receptor 78 (Olfr78), which in mice triggers changes in blood pressure. When researchers injected mice lacking the gene for Olfr78 with short-chain fatty acids, the animals’ blood pressure dropped, suggesting that Olfr78 by itself normally increases blood pressure in response to the compounds. But blood pressure regulation is complicated, and Pluznick found another, nonolfactory receptor called Gpr41 that decreased blood pressure in response to short-chain fatty acids and had a stronger effect than Olfr78.8 Pluznick suggests that the two receptors might act together to produce a buffering effect that protects against wild swings in blood pressure as fatty-acid levels fluctuate. Misplaced olfactory receptors may also prove useful in cancer treatment. Hatt has identified olfactory receptors expressed very highly in a number of different types of cancer cells, and stimulating those receptors caused tumors to shrink in vitro.9 Although much more research is needed to be able to translate those findings into a cancer therapy, Hatt is hopeful that the field is headed in that direction. “I think it will be a huge new family of possible targets for diagnosis and therapy for different diseases,” he says. 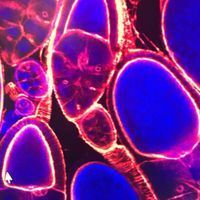 LIGHTING UP THE BLOOD: Human aortic smooth muscle cells produce melanopsin (Opsin?4), a photopigment that mediates a relaxation of the vasculature in response to blue light.SEBASTIAN F. BARRETO ORTIZ, PH.D. POSTDOCTORAL FELLOW, INTEGRATED VASCULAR BIOLOGY LAB DEPT. OF ANESTHESIOLOGY AND CRITICAL CARE MEDICINE JOHNS HOPKINS MEDICINE In the late 1990s, when the University of Virginia’s Ignacio Provencio first started looking for melanopsin—hitherto found only in amphibian eyes—in mammals, “it was largely considered a quixotic endeavor by most people in the vision field,” he says. It wasn’t until 2000, when he documented the expression of melanopsin in the human and mouse retina (specifically, in the cells of the inner retina), that it became clear that the opsins in rods and cones weren’t the only light-sensitive photopigments in mammalian eyes.10 Since then, melanopsin has been implicated in a number of light-induced phenomena in mammals, including regulation of the circadian clock, constriction of the pupil in response to light, and effects on alertness, learning, and metabolism. “We’re still at that discovery stage where we’re trying to identify what are these other effects of light,” says Provencio. It was only after Berkowitz switched lab spaces that it became clear to him that melanopsin wasn’t limited to the retina. After Sikka observed the relaxation of blood vessels when the automatic lights switched on, Berkowitz and his team began searching for expression of the melanopsin gene Opn4 and found that it was “quite ubiquitous throughout blood vessels,” he says. Using Opn4 knockout mice and pharmacological inhibitors, the researchers confirmed that melanopsin indeed mediated the relaxation of blood vessels in response to light.11 This photorelaxation effect was specific to the blue wavelengths of light, consistent with the pigment’s absorption spectrum. Berkowitz’s team also discovered that photorelaxation was regulated by G protein–coupled receptor kinase 2 (GRK2). While exposure to light alone could cause a 20 percent to 25 percent relaxation of blood vessels, coupling light with a GRK2 inhibitor resulted in a 75 percent to 100 percent relaxation. LIGHT: Melanopsin, a light-sensitive pigment not involved in vision, is expressed in many different blood vessels. When exposed to blue wavelengths of light, the melanopsin and G protein–coupled receptor kinase 2 (GRK2) mediate the relaxation of the vessels. The combination of light and a GRK2 inhibitor resulted in a 75 percent to 100 percent relaxation of blood vessels in vitro. Regardless of its physiological role, Berkowitz is trying to harness light-induced photorelaxation to treat vascular diseases, such as Raynaud’s phenomenon. Patients with Raynaud’s experience an extreme constriction of the blood vessels in their fingers and toes in response to cold, limiting circulation and causing these extremities to feel numb or painful. Patients could potentially wear gloves that emit blue light to improve their peripheral blood flow, Berkowitz suggests. This could “induce some relief for these patients that have terrible cold and pain and can’t pick up a glass of cold soda,” he says. 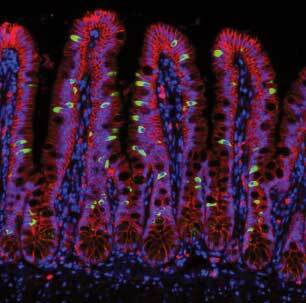 Some taste receptors in the gut appear to detect nutrients from food. 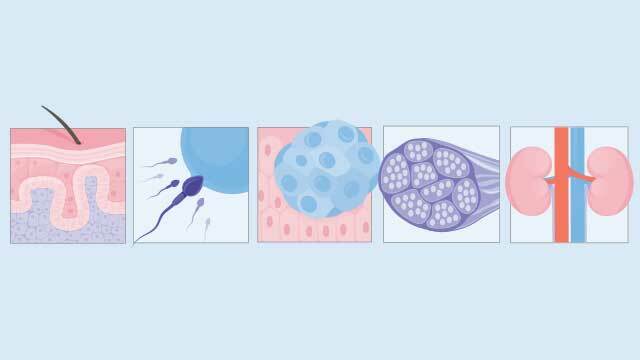 Others are present in mouse testes and sperm, and knocking them out renders mice infertile, although the mechanism is unknown. A number of recent reports also indicate a role for taste receptors in our body’s immune reaction to certain bacteria and parasites. TASTE: Taste receptors have been found all over the body, including the testes, sperm, airway, and gut. They have many different functions, including detecting nutrients in food, regulating the immune response to bacteria and parasites, and influencing mouse fertility. See full infographic: WEB | PDF© LUCY READING-IKKANDASince Finger’s study, bitter taste receptors have been identified in solitary chemosensory cells of the human upper airway as well, and Noam Cohen of the University of Pennsylvania and the Monell Chemical Senses Center has found that sweet taste receptors are also expressed in those cells, and that the two play complementary roles in innate immunity.14 Activating sweet receptors with glucose or sucrose inhibits the bitter receptors on the same cell. Cohen found that the normal low level of glucose in the airway was sufficient to inhibit bitter receptors and prevent the secretion of antimicrobial peptides. Bacteria in the airway feed on glucose, so levels of the sugar are “basically an indirect measurement of how much bacteria are around,” says Cohen—“the more bacteria, the less glucose.” He suspects that as bacteria increase, glucose levels drop, freeing up bitter receptors to respond to bacterial compounds. Some patients with chronic sinusitis or diabetes have elevated glucose levels in their airway, which could help explain their susceptibility to respiratory infections, Cohen speculates. Taste receptors’ response to bacterial signals occurs within seconds or minutes, making them a first line of defense against airway pathogens, Cohen says. As a result, the type of receptors we have may affect how we react to upper respiratory infections. Cohen studied T2R38, a bitter taste receptor in ciliated cells, that is quite variable in human populations. It’s the same receptor that’s thought to make some people “super-tasters,” particularly sensitive to bitter compounds found in foods such as broccoli and brussels sprouts. Patients with the super-taster version of the receptor may be able to detect bacterial compounds at very low concentrations in the airway, Cohen suggests. 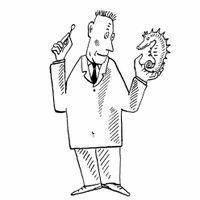 The receptor “doesn’t even let bacteria get a foothold to set up any kind of colonization or infection,” he adds. Cohen and his colleagues found that patients with this version of T2R38 very rarely got gram-negative upper respiratory infections, and the type of receptor a patient possesses predicts the success of sinus surgery. When patients have chronic sinusitis that’s severe enough to require surgery, Cohen found, those who are more sensitive to bitter compounds do much better post-surgery, with fewer subsequent infections and improved breathing and sleeping compared with those who are less sensitive. Cohen suggests that having a patient taste a variety of nontoxic chemicals to rate their bitterness could serve as a cheap and rapid diagnostic tool. “Our ultimate goal is to use this to try to determine what potential pathogens an individual could be susceptible to,” he says. Eventually, researchers may be able to take advantage of the taste receptors for therapeutic purposes, perhaps by squirting a bitter substance into the nose to stimulate an innate immune response. Cohen plans to start testing candidate therapeutic compounds in clinical trials this year. “If this works the way we think it might work, it might be the first line of therapy you get when you come in with some sort of infection,” he says. Recent findings suggest that taste receptors may also play a critical role in immune responses in the gut. Taste receptors are expressed in certain epithelial cells in the gut, called tuft cells, and “the assumption was that this might have something to do with reacting to food,” says Harvard University’s Michael Howitt. But after seeing Finger’s and Cohen’s work, Howitt wondered if taste could also play a role in detecting microbes. Sure enough, Howitt discovered that taste signaling by tuft cells can be activated by single-celled and roundworm parasites in the mouse gut.17 “If you think about the intestine almost as a medieval castle, the tuft cells are like the little guards posted on the various towers,” he says. “If they detect, through taste, the parasites, then they sound the alarm to the immune system.” Although the exact receptors involved remain to be discovered, Howitt found that without key taste signaling molecules, the immune system never reacts, and the gut struggles to get rid of the parasites. The findings raise the possibility “of taste not only as a way to discriminate between different foods, but that it might be broadly conserved in detecting a whole suite of different microbes,” Howitt says. Sandeep Ravindran is a freelance science writer living in New York City. L. Buck, R. Axel. “A novel multigene family may encode odorant receptors: A molecular basis for odor recognition,” Cell, 65:175-87, 1991. M. Parmentier et al., “Expression of members of the putative olfactory receptor gene family in mammalian germ cells,” Nature, 355:453-55, 1992. P. Vanderhaeghen et al., “Olfactory receptors are displayed on dog mature sperm cells,” J Cell Biol, 123:1441-52, 1993. M. Spehr et al., “Identification of a testicular odorant receptor mediating human sperm chemotaxis,” Science, 299:2054-58, 2003. 5. D. Busse et al., “A synthetic sandalwood odorant induces wound-healing processes in human keratinocytes via the olfactory receptor OR2AT4,” J Invest Dermatol, 134:2823-32, 2014. C.A. Griffin et al., “MOR23 promotes muscle regeneration and regulates cell adhesion and migration,” Dev Cell, 17:649-61, 2009. C. Pichavant et al., “Decrease of myofiber branching via muscle-specific expression of the olfactory receptor mOR23 in dystrophic muscle leads to protection against mechanical stress,” Skelet Muscle, 6:2, 2016. J.L. Pluznick et al., “Olfactory receptor responding to gut microbiota–derived signals plays a role in renin secretion and blood pressure regulation,” PNAS, 110:4410-15, 2013. E.M. Neuhaus et al., “Activation of an olfactory receptor inhibits proliferation of prostate cancer cells,” J Biol Chem, 284:16218-25, 2009. 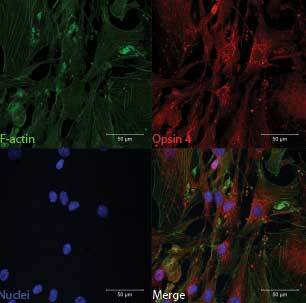 I. Provencio et al., “A novel human opsin in the inner retina,” J Neurosci, 20:600-05, 2000. G. Sikka et al., “Melanopsin mediates light-dependent relaxation in blood vessels,” PNAS, 111:17977-82, 2014. T.E. Finger at al., “Solitary chemoreceptor cells in the nasal cavity serve as sentinels of respiration,” PNAS, 100:8981-86, 2003. M. Tizzano et al., “Nasal chemosensory cells use bitter taste signaling to detect irritants and bacterial signals,” PNAS, 107:3210-15, 2010. R.J. Lee et al., “Bitter and sweet taste receptors regulate human upper respiratory innate immunity,” J Clin Invest, 124:1393-405, 2014. A.S. Shah et al., “Motile cilia of human airway epithelia are chemosensory,” Science, 325:1131-34, 2009. R.J. Lee et al., “T2R38 taste receptor polymorphisms underlie susceptibility to upper respiratory infection,” J Clin Invest, 122:4145-59, 2012. M.R. Howitt et al., “Tuft cells, taste-chemosensory cells, orchestrate parasite type 2 immunity in the gut,” Science, 351:1329-33, 2016.